What if reading devotional materials was as easy as reaching for the telephone? Well, now there’s an app that does just that. 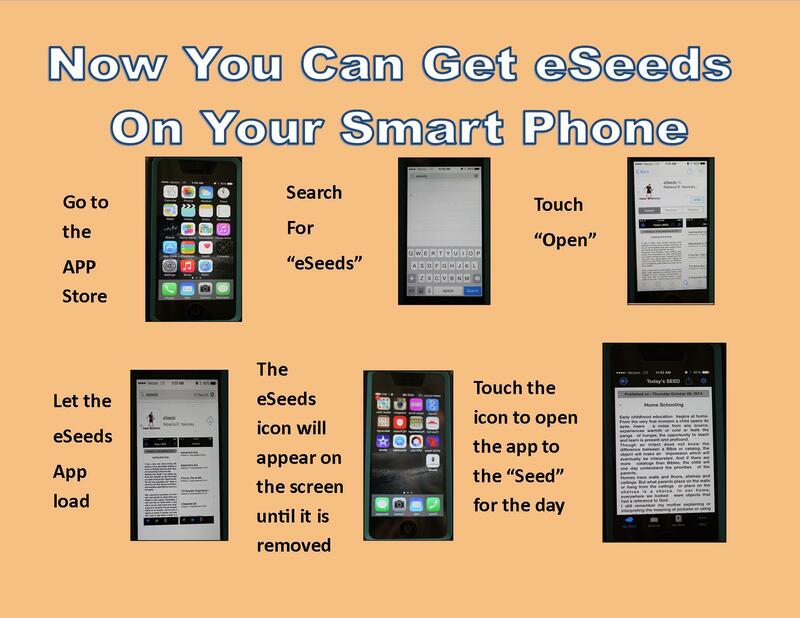 The new eSeeds application puts the daily devotionals, Seeds of Wisdom, as close as the reader’s smartphone. This app is the brainchild of Guido Evangelistic Association President, Dr. Larry Guido, and GEA Board Member, Ron Stalnaker. Included with the daily devotionals is a full bible available in multiple translations. The daily “seed” can be easily read. The text size can be manipulated to suit the reader’s needs and there is a night mode for reading in low-light and dark settings. In order to accommodate just about anyone, the app provides a feature that will read the devotional and the bible aloud. Making the app fully interactive, the time feature can be set to send a reminder at the same time each day and prayer requests can be submitted via the telephone as well. As readers find devotionals they enjoy or scriptures they would like to share with others, all content on the app can be easily shared on social media such as Facebook and Twitter or it can be sent via email. For over 63 years, GEA has faithfully served the Lord by sowing God’s Word to individuals all over the world. First through evangelistic meetings, then radio and television broadcast, and now via the internet and Smart phones, the ministry has presented God’s message of love, mercy, grace, and salvation to the world. With the new eSeeds app, the messages from the Sower invite people to delve deeper into their Christian Faith wherever and whenever they feel the need. God’s message of love and hope has not changed, however the methods of spreading His word have been expanded to include modern technology. According to Stalnaker, the Apple version of the app contains much richer features than the Android version. Because of this, the Android version will be rewritten and enriched soon. Below is a graphic to help you find it on your phone’s Play Store. You can click here to go there directly. For Android, click here.